PSP Flash Player Released ! PSPHacks.net and 71M, in cooperation with RK Digital.net, Heavy.com and Newgrounds.com is proud to present the PSP Flash Player! The current version supports most action script through version 7 and runs on 1.5 only. We are currently testing for 2.x PSPs and will announce when it is working on 2.x firmwares. If someone gets it working, be sure to let us know. Source will be released in a couple of days once we get it all cleaned up. It is still a little bit buggy on flash files which use MP3 sound. PCM sound is fully supported. MP3 decoding just eats up too much memory right now when decoding the mp3 stream to a raw sound stream so we ask for your paitence. Also, loading times are being worked on. Basically everything needs to be converted and cached in memory (of which there is not alot available) and this takes a little while. Ok, now for what you really want, the download link. Today Adobe has organized a workshops day called : Creativity Day. The event is totally free, but don't forget to register from the Adobe site. Adobe LiveCycle is an incredible and powerful product. Adobe has launched the LiveCycle Performance Center, a resource that provides uidelines for improving and troubleshooting performance-related issues of your Adobe LiveCycle enterprise applications. These guidelines apply to LiveCycle Designer 7.1 and Adobe LiveCycle Forms 7.1. They will help you create and maintain LiveCycle Designer 7.1 forms for optimal performance and troubleshoot performance-related issues. These guidelines will help you create and maintain LiveCycle Designer 7.0 forms for optimal performance and troubleshoot performance-related issues. Nokia has its official training curriculums. The training courses are organized into three different types of development, known as tracks. These tracks are Symbian/C++, Java™ ME, and Rapid Development. 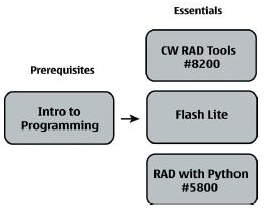 I noticed that the Nokia Rapid Application Development track includes a Flash Lite course ! Cost effective development is on the mind of all developer managers and RAD concepts allow projects to get off the ground faster and with immediate customer feedback. The courses in this track introduce new ways to prototype or build your proof of concept applications for Series 60. More and more companies are using mobile devices (PDA and phones) to have information on demand, when and where they want it. Mobile learning is evolving into an interactive experience for employees. And Flash Lite has the capabilities to support learning activities. With my company, Comtaste, we started to show and present several italian companies how to make use of mobile devices for learning purposes. I found this Flash Lite learning content from Robert Hall (via Tom King). Does anyone have some experience on this field ? Recently I used a lot Adobe Captivate to create some tutorials for a course. A friend of mine pointed me out this free software : Wink. I read the features and there are a lot of cool things you can do : capture screenshots, add explanations boxes, buttons, titles. This software could be a great compepitor for Captivate. I often use to send (yes I know I'm not the only) PDF via email. An important issue is the file size. In Acrobat 7 to get the dimension of your document go to File > Document Properties and select the Description tag. Now all you have to do is to send the optimized pdf via email : go to File > Email and a email dialog window opens ! Don't miss the Adobe Reduce PDF file size article. I hope to not miss the event ! See you there ! Tom pointed out a great blog that gives information, tips and tricks on usability on mobile phones: Mobiface. 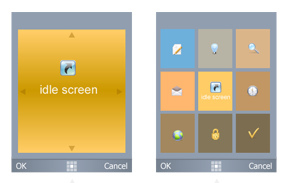 Flash Lite for Sony PSP and PS3 .... just rumors ? “Sony are prepping our new mobile ‘Flash Lite’ platform for PSP and PS3. They intend to combat XBox Live Arcade with downloadable flash games to your PS3 and PSP. They understand the potential of Flash Lite since the development costs are low and we have a DRM solution in place so online content delivery is taken care of.